Carmarthen (/kɑːrˈmɑːrðən/; Welsh: Caerfyrddin [kɑːɨrˈvərðɪn], "Merlin's fort" or "Sea-town fort") is the county town of Carmarthenshire in Wales and a community. It lies on the River Towy 8 miles (13 km) north of its estuary in Carmarthen Bay. Carmarthen has a claim to be the oldest town in Wales – Old Carmarthen and New Carmarthen became one borough in 1546. Carmarthen was the most populous borough in Wales in the 16th–18th centuries, described by William Camden as "the chief citie of the country". Growth was stagnating by the mid-19th century, as new economic centres developed in the South Wales coalfield. The population in 2011 was 14,185, down from 15,854 in 2001. Dyfed–Powys Police headquarters, Glangwili General Hospital and a campus of the University of Wales Trinity Saint David are located in Carmarthen. When Britannia was a Roman province, Carmarthen was the civitas capital of the Demetae tribe, known as Moridunum ("Sea Fort"). It is possibly the oldest town in Wales, recorded by Ptolemy and in the Antonine Itinerary. The Roman fort is believed to date from about AD 75. A Roman coin hoard was found nearby in 2006. Near the fort is one of seven surviving Roman amphitheatres in Britain and only two in Roman Wales (the other being at Isca Augusta, Roman Caerleon). It was excavated in 1968. The arena itself is 50 by 30 yards (about 46 by 27 metres); the cavea (seating area) is 100 by 73 yards (92 by 67 metres). Veprauskas has argued for its identification as the Cair Guorthigirn ("Fort Vortigern") listed by Nennius among the 28 cities of Britain in his History of the Britains. Evidence of the early Roman town has been investigated for a number of years, uncovering urban sites likely to date from the second century. The ancient Clas church of Llandeulyddog was an independent, pre-Norman religious community which became in 1110 the Benedictine Priory of St Peter, only to be replaced 15 years later by the Augustianian Priory of St John the Evangelist and St Teulyddog. This stood near the river, at what is now Priory Street (51°51′36″N 4°17′51″W﻿ / ﻿51.8601°N 4.2975°W﻿ / 51.8601; -4.2975﻿ (St John's Priory), SN418204). The site is now a scheduled monument. During the 13th century, Franciscan Friars (Grey Friars, or Friars minor) became established in the town, and by 1284 had their own Friary buildings on Lammas Street (51°51′21″N 4°18′33″W﻿ / ﻿51.855794°N 4.309076°W﻿ / 51.855794; -4.309076﻿ (Carmarthen Greyfriars)), on a site now occupied by a shopping centre. The Franciscan emphasis on poverty and simplicity meant the Church was smaller (reportedly "70 to 80 feet long and 30 feet broad" – 21/24 by 9 m) and more austere than the older foundations, but this did not prevent the accumulation of treasures, and it became a much sought after location for burial. In 1456 Edmund Tudor, 1st Earl of Richmond died of plague in Carmarthen, three months before the birth of his son, the future King Henry VII. Edmund was buried in a prominent tomb in the centre of the choir of the Grey Friars Church. Other notable burials were of Rhys ap Thomas and Tudur Aled. According to some variants of the Arthurian legend, Merlin was born in a cave outside Carmarthen. The town's Welsh name, Caerfyrddin, is widely claimed to mean "Merlin's fort", but it is also suggested the reality may be the other way around, that the name Merlin may have originated from the town's name in the anglicised form of Myrddin. (See Merlin § Name and etymology). An alternative explanation is that Myrddin is a corruption of the town's Roman name. Furthermore, many areas surrounding Carmarthen still allude to this, such as nearby Bryn Myrddin (Merlin's Hill). Legend also had it that if a particular tree called Merlin's Oak fell, it would be the downfall of the town. Translated from Welsh, it reads: "When Merlin's Oak comes tumbling down, down shall fall Carmarthen Town." To obstruct this, the tree was dug up when it died and pieces of it remain in the town museum. One of the earliest recorded Eisteddfodau took place at Carmarthen circa 1451, presided over by Gruffudd ap Nicolas. Following the Acts of Union, Carmarthen became judicial headquarters of the Court of Great Sessions for south-west Wales. In the 16th and 17th centuries, the town's dominant pursuit was still agriculture and related trades, including woollen manufacture. Carmarthen was made a county corporate by a charter of James I in 1604. This decreed that Carmarthen should be known as the 'Town of the County of Carmarthen' and have two sheriffs. This was reduced to one sheriff in 1835 and the ceremonial post continues to this day. In 1689, John Osborne, 1st Earl of Danby, was made 1st Marquess of Carmarthen by William III. Osborne was later created Duke of Leeds in 1694, and Marquess of Carmarthen became the Duke's heir apparent's courtesy title until the Dukedom became extinct on the death of the 12th Duke in 1964. In the late 18th century John Spurrell, an auctioneer from Bath, settled in Carmarthen. He was the grandson of Robert Spurrell, a Bath schoolmaster, who printed the first book, The Elements of Chronology, in the city in 1730. In 1840, a printing press was set up in Carmarthen by William Spurrell (1813–1889), who wrote a history of the town and compiled and published a Welsh-English dictionary (first published 1848) and an English–Welsh dictionary (first published 1850). Today's Collins Welsh dictionary is known as the "Collins Spurrell". A local housing authority in Carmarthen is named Heol Spurrell in honour of the family. Carmarthen Town Council, established in 1974, consists of 18 town councillors elected from the three wards of the town. The town council's responsibilities include maintenance of the town's five parks and of the town cemetery. The three electoral wards of Carmarthen Town North, Carmarthen Town South and Carmarthen Town West each elect two county councillors to Carmarthenshire County Council. St Peter's is the largest parish church in the Diocese of St David's and has the longest nave, being 60 metres from west porch to east window and 15 metres across the nave and south aisle. It consists of a west tower, nave, chancel, south aisle and a Consistory Court. It is built of local red sandstone and grey shale. The tower contains eight bells with the heaviest, tuned to the note E, weighing 15 cwt 1 qr 18 lbs (783 kg). The concrete A484 road bridge across the River Towy was designed by the Welsh architect Clough Williams-Ellis and completed in 1937. The bridge was Grade II listed in 2003. The loss of the original medieval bridge that it replaced caused controversy. To create better pedestrian access across the Towy from the railway station to the town centre, a cable-stayed bridge was constructed in 2005 linking to the foot of Blue Street. The cost was £2.8 million. The bridge was commended in 2007 by the Structural Steel Design Awards for its high-quality detailing. Previously, access was across Carmarthen Bridge some 700 feet (210 m) to the east. In 1828, a monument was erected at the west end of the town to honour Lieutenant General Sir Thomas Picton, from Haverfordwest, who had died at the Battle of Waterloo in 1815. The pillar, which was about 75 ft (23 m), was designed to echo Trajan's column in Rome. A statue of Picton, wrapped in a cloak and supported by a baluster above emblems of spears surmounted the column. The structure stood on a square pedestal. Access was by a flight of steps to a small door on the east side, facing the town. A series of bas-reliefs sculpted by Edward Hodges Baily adorned the structure. Above the entrance door was the name "PICTON", and over this a relief showing the Lieutenant General falling mortally wounded from his horse on the Waterloo battlefield. "WATERLOO" was written across the top. The west side had a relief beneath the title 'BADAJOS' showing Picton scaling the walls with his men during the Battle of Badajoz in 1812. On the south side of the pedestal was a description of Picton's life in English. A Welsh version of his exploits was inscribed on the north side. Each side of the square pedestal was adorned with trophies. The top of the square column was adorned with imitative cannons on each side. Within a few years, the monument had become dilapidated. The sculpted bas-reliefs proved "unable to withstand Carmarthen's inclement weather", according to local antiquarians. Although Baily made replacements, they were never put up. The entire pillar was taken down in 1846. In the 1970s, the replacement sculptures were rediscovered in Johnstown. They are now on display at Carmarthenshire County Museum. After demolition of the first monument, a new structure honouring Picton was commissioned. It was designed by architect Frances Fowler. The foundation stone was laid on Monument Hill in 1847. In 1984, the top section was declared to be unsafe and was taken down. Four years later, the whole monument was rebuilt stone-by-stone on stronger foundations. A statue of General Nott was erected in 1851. According to the PMSA, "The bronze statue was cast from cannon captured at the battle of Maharajpur. Queen Victoria gave 200 guineas to the memorial fund. The statue occupies the site of the market cross, which was dismantled when the market was resited and Nott Square created in 1846." The Market Square was where Bishop Robert Ferrar of St Davids was executed in March 1555. A small plaque below the statue of General Nott commemorates the place where he was burned at the stake during the Marian Persecutions. The many listed buildings in the town include The Guildhall, Capel Heol Awst, Capel Heol Dŵr, Carmarthen, Carmarthen Cemetery Chapel, Elim Independent Chapel, English Baptist Church, English Congregational Church, Penuel Baptist Chapel, Christ Church, Eglwys Dewi Sant, Church of St Mary and Eglwys Sant Ioan. Motorcycle speedway racing was staged in the early 2000s at a track built on the showgrounds on the western outskirts of the town. The team raced in the Conference League. CPC Bears is a rugby league club based in Carmarthen and the regional side for Carmarthenshire, Pembrokeshire and Ceredigion. They play in the Welsh Premier Division of the Rugby League Conference. The town has a semi-professional football team, Carmarthen Town F.C. which plays in the Welsh Premier League, the top league in Welsh football. The team plays its home games at Richmond Park. The club colours, reflected in its crest and kit, are gold and black. The team was founded in 1948. The town also has two golf courses, a leisure centre with an eight-lane, 25-metre swimming pool that is the home of Carmarthen district swimming club, a synthetic athletics track, and an outdoor velodrome. Carmarthen has an athletics team, Carmarthen Harriers. A cycle track was established in the town about 1900 and remains in use. The A40, A48, A484 and A485 converge on Carmarthen. The M4 route, which links South Wales with London, terminates at junction 49, the Pont Abraham services, to continue north-west as the dual carriageway A48 and finish at its junction with the A40 in Carmarthen. Carmarthen railway station is on the West Wales Line. It opened in 1852. Carmarthen town is served by rail links to Cardiff via Swansea to the east and Fishguard Harbour, Milford Haven, Tenby, Pembroke and Pembroke Dock to the west. Carmarthen town is served by daily direct intercity trains to London. It suffered a number of rail closures in the 1960s under the Beeching Axe. The one to Llandeilo closed in 1963 and one to Lampeter and Aberystwyth in 1965. Carmarthen is a stop on the Eurolines bus route 890, which links a number of cities and towns in Munster and South Leinster in Ireland to London. The service may be used to destinations in Ireland, but may not be used to other stops in Great Britain. There is a Park and Ride service running daily from Monday to Saturday from 7.00 to 19.00 between Nantyci, to the west of Carmarthen town, and the town centre. The former cattle market in the heart of the town has undergone regeneration. The new shopping centre opened on 30 April 2010. The development includes a new multi-screen cinema, a Debenhams department store, a market hall, restaurants and a multi-storey car park. The new market hall opened on 8 April 2009. David Glyndwr Tudor Williams, first full-time Vice-Chancellor of the University of Cambridge, 1989–1996. Chisholm, Hugh, ed. (1911). "Carmarthen" . Encyclopædia Britannica (11th ed.). Cambridge University Press. ^ Paxton, John (1999). The Penguin Encyclopedia of Places. Penguin. p. 174. ISBN 0-14-051275-6. ^ a b Davies, John; Jenkins, Nigel (2008). The Welsh Academy Encyclopaedia of Wales. Cardiff: University of Wales Press. p. 123. ISBN 978-0-7083-1953-6. ^ "KS01 Usual resident population: Census 2001, Key Statistics for urban areas". Office for National Statistics. Retrieved 30 August 2010. ^ "Roman treasure discovered on farm". BBC News. 17 June 2006. Retrieved 28 April 2010. ^ Veprauskas, Michael. [www.vortigernstudies.org.uk/artgue/mikecaer.htm "The Problem of Caer Guorthigirn" at Vortigern Studies]. 1998. ^ "Carmarthen Roman dig is filled in after key findings". BBC News. 30 September 2018. Retrieved 30 September 2018. ^ James, Heather. "The Geography of the Cult of St David" in St David of Wales: Cult, Church and Nation, p. 68. Boydell Press, 2007. Accessed 26 March 2013. ^ Wade-Evans, Arthur. Welsh Medieval Law, p. 263. ^ Philip Ziegler, The Black Death, Penguin, 1969, p. 199. ^ "St John's Priory". Coflein Database Record. Royal Commission on the Ancient and Historical Monuments of Wales. Retrieved 28 November 2016. ^ "Site details: Carmarthen – Monastic Wales – A Comprehensive Database of Sites and Sources". Monastic Wales. Retrieved 2014-02-10. ^ a b "Site details: Carmarthen – Monastic Wales – A Comprehensive Database of Sites and Sources". Monastic Wales. Retrieved 2014-02-10. ^ a b c d e "TheGreyFriarsOfCarmarthen < Historian < Thayersfarm". Carmarthenshirehistorian.org. Archived from the original on 2014-02-22. Retrieved 2014-02-10. ^ "People: Edmund Tudor, Earl of Richmond – Monastic Wales – A Comprehensive Database of Sites and Sources". Monastic Wales. Retrieved 2014-02-10. ^ "Remnants of Carmarthen Friary – article from – Monastic Wales – A Comprehensive Database of Sites and Sources". Monastic Wales. Retrieved 2014-02-10. ^ Merlin’s Town, Carmarthen Town Council. Retrieved 21 August 2018. ^ "9/11 inspires trip to 'Merlin's Oak'". walesonline.co.uk. 1 October 2003. Retrieved 25 August 2013. ^ Evan David Jones. "GRUFFUDD ap NICOLAS (fl. 1425-1456), an esquire and a leading figure in the local administration of the principality of South Wales in the middle of the 15th century". Dictionary of Welsh Biography. Retrieved 17 March 2019. ^ "myADS". Archaeology Data Service. Retrieved 2014-02-10. ^ "These towns have been named as the best places to live in Wales". Wales Online. ^ "Carmarthen Town Council". Carmarthen Town Council. Retrieved 2018-03-09. ^ "Discover Castle House". Discovering Carmarthenshire. Carmarthenshire County Council. Archived from the original on 16 April 2016. Retrieved 2 April 2016. ^ "St Peter's and its History". netministries.org. Retrieved 26 October 2013. ^ "Towy Bridge (that part in Carmarthen Community), Llangunnor". British Listed Buildings. Retrieved 21 September 2017. ^ "Pont King Morgan". Lunemillenniumbridge.info. Archived from the original on 2015-01-03. Retrieved 2015-01-03. ^ "Pont King Morgan, Carmarthen". SteelConstruction.org. Archived from the original on 2015-01-03. Retrieved 2015-01-03. ^ "Carmarthen's £74m retail centre opens". BBC News. 2010-04-30. Retrieved 2014-02-10. ^ "UK | Wales | South West Wales | Revamp of the town cattle mart starts". BBC News. 2008-03-20. Retrieved 2014-02-10. 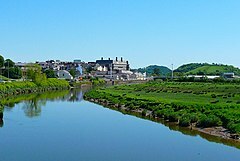 Wikimedia Commons has media related to Carmarthen. Wikisource has the text of the 1911 Encyclopædia Britannica article Carmarthen.